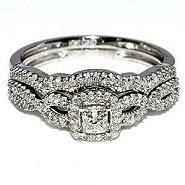 A bridal set, also called a wedding set, is a pair of rings designed to be worn together. 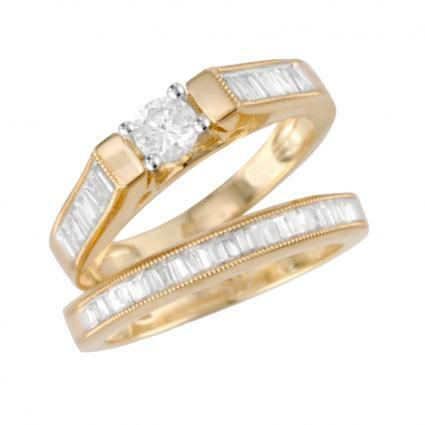 These sets integrate the engagement ring and wedding band into one uniform design. They are available in many different options, from fairly simple styles to very elaborate designs in all price ranges. Bridal sets range from simple diamond solitaire engagement rings with understated wedding band wraps to elaborate designs with both rings sporting multiple accent stones to surround a fancy shaped diamond. Parallel rings are similar to traditional, separate rings, and either ring can be worn by itself. The wedding band may be plain or may have matching details, such as inset stones or a pave setting, that coordinates with the engagement ring. 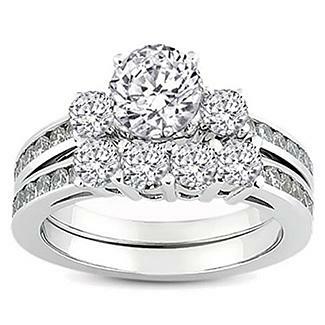 In a parallel set, the wedding band typically does not have raised stones or other elaborate details that might interfere with the engagement ring when the two pieces are worn together. An integrated set is a more elaborately designed pair, and the wedding band cannot usually be worn without the accompanying engagement ring without appearing incomplete. In many cases, the wedding band is designed as a coordinating diamond ring wrap for the engagement ring, perhaps supplying accent stones or finishing details to the engagement ring. 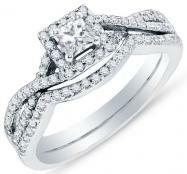 The primary stone in the engagement ring becomes the centerpiece for the complete set. Zales: This jewelry store offers an extensive selection of sets, with options available in every budget, from sets that are priced below $600 to options costing more than $17,000. White and yellow gold settings are available, as are multiple stone options. Use the online locator to find a retail store you can visit in person or shop online. Site to store shipping is free; Federal Express and U.S. Postal Service (USPS) shipping area available for a fee. Jared: Though the price range is not as wide as that of Zales, Jared carries a lovely selection of sets to fit a variety of budgets. This retailer's wedding sets are priced starting at $1,100 and costing upward beyond $10,000. Both white and yellow gold selections are available in many styles, including designs from well-known designer Neil Lane. Find a store near you or shop online. Online orders can be shipped to the store at no charge. Fee-based Federal Express and USPS shipping is also available. 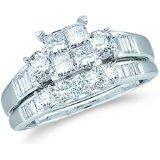 Helzberg Diamonds: This jeweler offers several beautiful sets priced between $1,900 and $3,800. 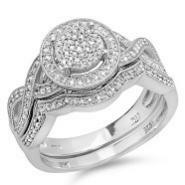 Each style is done in 14 karat white gold with settings. 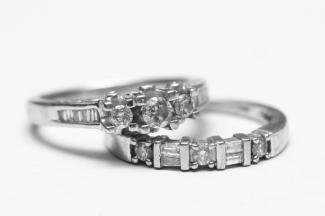 A variety of luxury designs are available, including those that feature round and square solitaires, baguettes and more. Visit the store locator to find a retail location near you or enjoy free shipping to your door with your online order. Be sure to consider relevant concerns before making a purchase decision. The biggest concern about sets is the inability for integrated rings to be worn separately. The bride-to-be will need to forfeit her engagement ring prior to the wedding ceremony, as the two rings should be soldered together for a seamless, permanent fit. 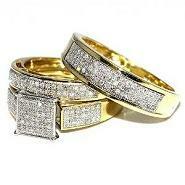 If the rings are not permanently joined and the engagement ring is lost, the wedding band can no longer be worn. If the woman eventually wants to pass on her engagement ring as an heirloom, it is impossible to do so with a set unless she also gives up her wedding band. Another concern about wedding sets is their inherent intricacy. Bridal sets often feature multiple accent stones in a pattern that surrounds a larger center stone, which means they may be more susceptible to accidental damage during daily wear than simpler designs. Because of this, many of these styles of rings are not appropriate choices for women who lead very active lifestyles or who prefer more subtle, understated jewelry. 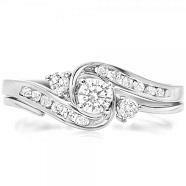 Engagement ring sets can be beautifully integrated designer pieces or simply elegant matched rings, perfect for a discriminating couple who wants a lasting, elegant symbol of how intertwined their relationship truly is.